usually dated, and make it current again. When you give something that last lil umph to push it over the edge and renew it’s life again. The Habitat for Humanity ReStore in Cary, NC. Low and behold they were having a BOGO sale on all brass light fixtures. You didn’t have to tell us twice and we quickly picked out two sizable ones and walked away paying $35.00 for both. take one light and leave the other, or take both and leave Fenway. Only kidding, Fenway made the trip home with us and Matt’s super generous Mom and Step-dad drove the larger of the two fixures to TN a few weeks later. GO MOM!!! candle tubes on the light to keep paint from getting inside the light socket. I prefer cotton over tape so that I can slide the tubes up and get even better coverage, plus the cotton helps hold the tubes in place and keeps them from slipping back down. 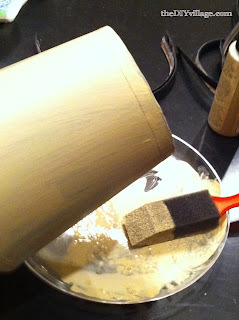 To keep the candle tubes from discoloring I primed them with a high heat spray paint intended for use on grills. There are a few different brands on the market but my favorite so far is the ACE hardware brand. It dries well and does not run like other brands can. Once the high heat paint was dry I spray painted the rest of the light with an Oil Rubbed Bronze finish paint by RustOleum. This stuff is absolutely amazing and looks so pretty in the sunlight. My hat is off to whoever invented this stuff, it’s awesome! We left both lights out on the line for a few hours (whatever the manufacturer recommends) and came back for a second and final touch up coat. Once the dining room light was dry and cured Matt went ahead and hung it for me! I still had the light shades to re-cover but I couldn’t wait to see it up. Since the light shades were black I painted them with a tan craft paint so that the black would not show through my fabric. It took two coats to get a decent coverage. 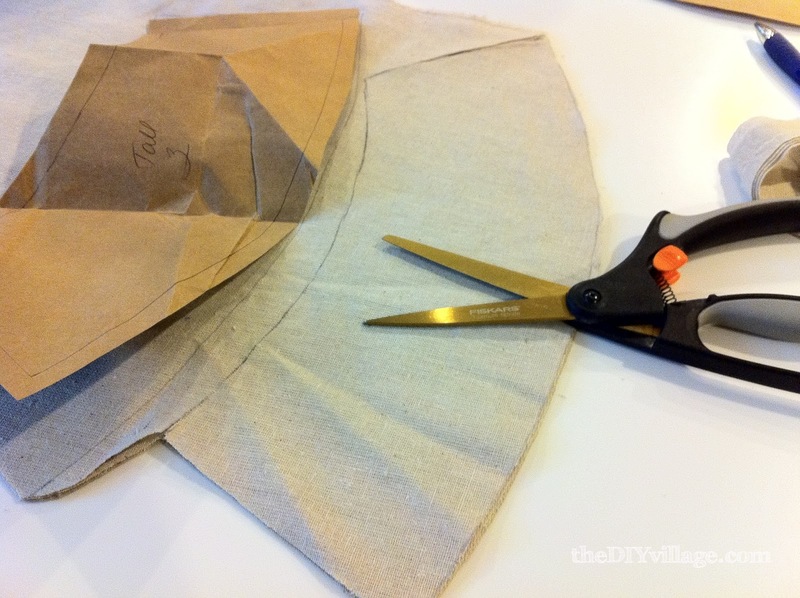 While the paint was drying on the shades I made a pattern out of a paper bag. fabric and cut out my shade fabric. I opted for the super sticky spray adhesive and attached the fabric to the shades. 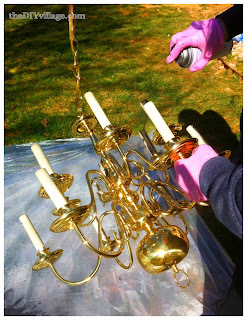 Then it was time to figure out how to hang the LARGE entrance chandelier. WARNING the following is not for the faint of heart! Our entrance foyer is over 2 1/2 stories tall, it was obvious a ladder alone wasn’t going to cut it on this one. Matt was able to borrow a scaffolding from a friend (thank you Hopper). scaffolding was wider than the foyer opening. that we borrowed from my father. It looked a little something like this – GAH! I am so thankful my husband is not afraid of heights! Once he had all the wiring in place and ready to go, up the ladder he went. At this point I was ready to throw up for him, but he was cool about it and didn’t mind one bit. I was given the honor of flipping the light switch! And then of course I made Matt smile and say Cheese! This looks 1000 times better than the original light fixture that was not only covered in dust, it had a burnt out bulb and rust … I can only assume the rust is due to East TN humidity in the summer months. 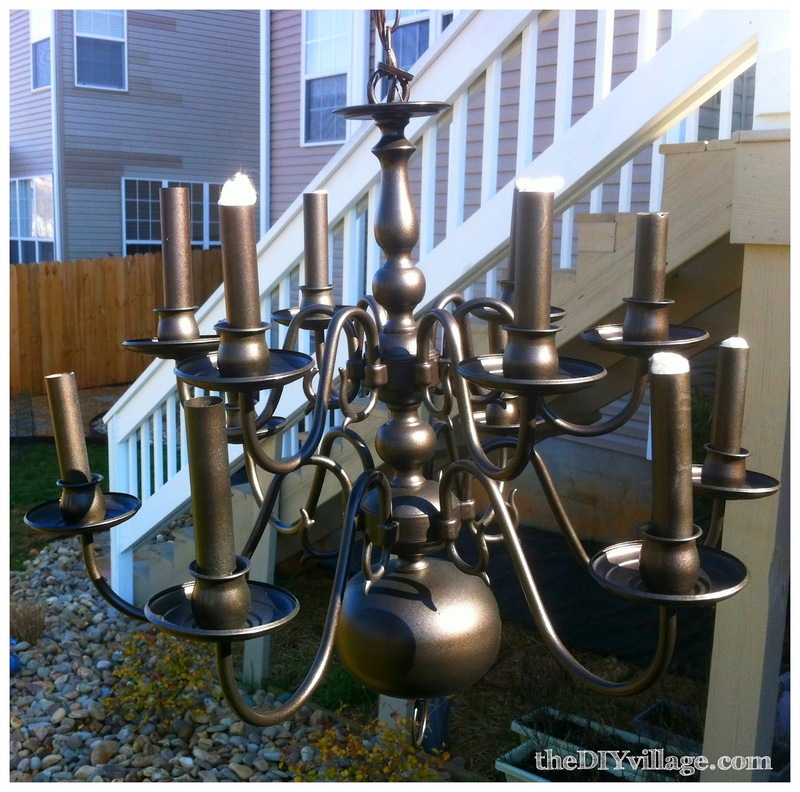 I have shades for the entrance chandelier but am not sure if I will use them yet or not. But it’s now or never and before that scaffolding comes down I better make up my mind … FAST! You've inspire me. I plan to upcycle a very similar light fixture that has been in my dining room for….well… a long time! Thats awesome! 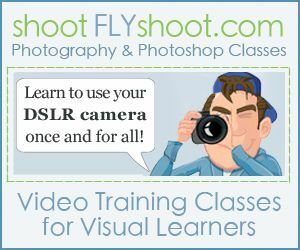 You will have to send us before and after pictures, we would love to see them! I'm leaning that way, just one more thing to have to dust … and at that height it's not going to be me! NICE JOB! Whoa, seeing your hubs up that high gave me a scare and I'm not afraid of heights either. Thanks for sharing it with me. Off to share it on Twitter, etc. Thank you so much we are so happy with them. I guess being a firefighter helps with his fear of heights … err lack of fear. Yesh! Wow! 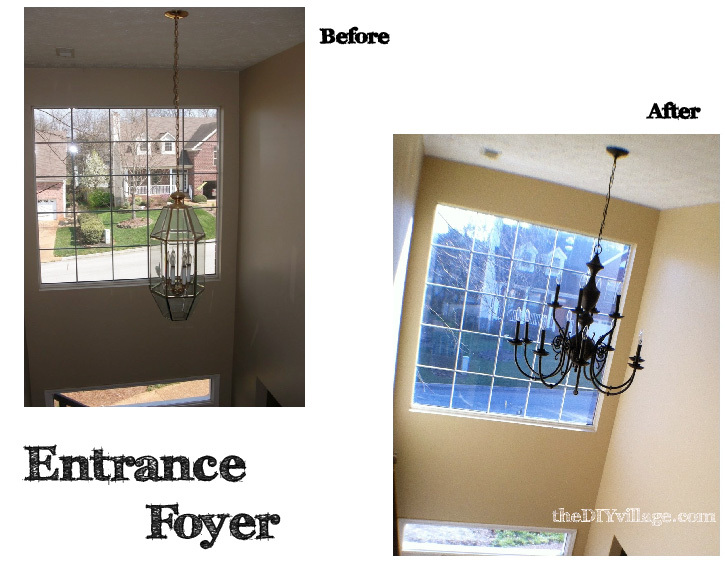 What a difference – and a money saver too! It's funny, I think we all had that before fixture in our foyers at one time or another! Awesome! What a dramatic change for both fixtures. 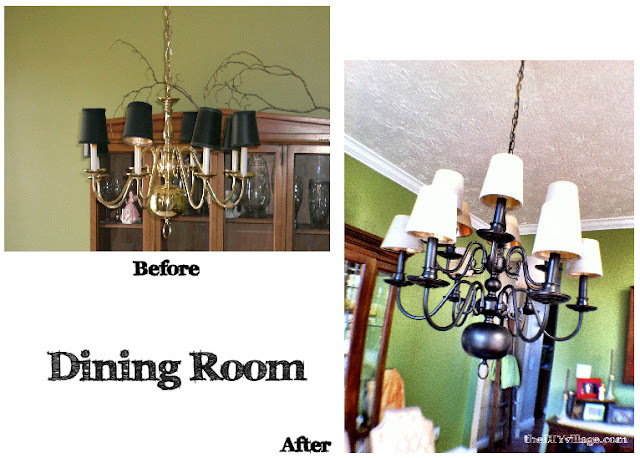 I have had good luck with ReStore fixture makeovers too. Cheap and no one ever knows! I highly recommend checking them out on a regular basis. You never know what you are going to find! Oh my! I almost had a panic attack just looking at that height on the monitor! LOL I am deathly afraid of heights. I continued on anyway and I'm glad I did because I got to see your beautiful, new chandeliers! Haha he is a very brave man. Then again if he was afraid of heights he wouldn't be very good at his job!. Oh my! Great work. I love the entry chandy! And I think it looks great without the shades. So elegant up there. I clicked over from Southern Hospitality. I followed your instructions to a tee and mine came out perfect. Thank you! looks great! we just replaced our white ceiling fan in our master bedrrom’s vaulted ceiling with a similar fixture. It’s large and made or black iron/metal so we didn’t have to do anything to it!!! yay for $50 yard sale scores! but my husband looked similar up on the ladder hanging the fixture by himself! Love the light fixtures. But I’m LOVING the green paint color in the dining room. Dp you mind sharing the color and brand? I’m looking for a green, and yours is exactly the look I want! I’m SO excited to find out and get painting! Do you mind telling me what COLOR high heat paint you used at first? I see it in white, black, almond and green? Thanks! Looking forward to doing this project! I have the EXACT same entryway AND chandelier!!!! I need scaffolding I guess. Can u rent that stuff?? I think you can at places like United Rentals. You may just want to call around and make sure that it’s not bigger than your entrance foyer!